The Topcon team field testing their autonomous bulldozer technology. The Baskin School of Engineering’s Corporate Sponsored Senior Project Program (CSSPP) provides students with a unique opportunity to experience working on real-world engineering projects as part of their undergraduate education. Participants in this year's program presented their finished work at Partner's Day on Tuesday, June 5. The projects included a system to detect foreign objects in a produce processing line and technology to support automation in construction vehicles. Throughout the academic year, students in the program interact with teammates, sponsors, and faculty. Some make visits to their corporate sponsor’s worksite, and all are required to solve problems along the way. By working with mentors at corporate partner companies, students learn important skills, take on interesting challenges, and begin to understand what it means to be a professional engineer. This year's sponsors included Topcon Positioning Group, a provider of high-precision positioning technology using global navigation satellite systems for construction, geopositioning, and precision agriculture. Among Topcon’s offerings are several applications that support automation in construction vehicles. 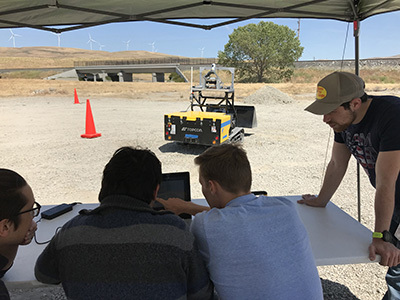 Students James Trombadore, David Kooi, Kiefer Selmon, and Donald Avansino worked with Topcon to research and develop technology that would enable a bulldozer to autonomously identify, approach, and dig a stockpile at a construction site. Topcon provided the team with a small-scale bulldozer prototype called the HouseCat mkII. 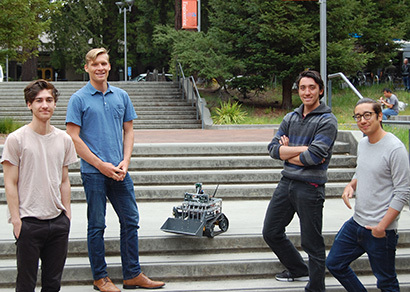 The students had just four months to create the technology that would give this prototype its autonomous functionality. The team broke the problem down into three distinct components: identifying and aligning with a stockpile; determining the optimal approach to the stockpile; and performing and verifying the dig. They mapped out a solution that relied on sophisticated concepts from computer science and engineering, including machine learning, computer vision and neural networks. Another project was sponsored by Atollogy, a Software-as-a-Service (SaaS) software company that offers proprietary algorithms and capabilities for managing operations by integrating the physical world with artificial intelligence. 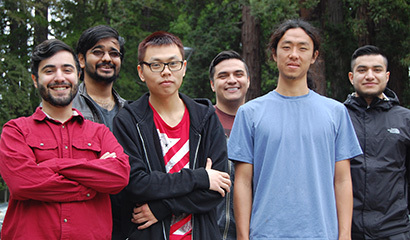 Students An Tran, David Munoz, Cesar Neri, Kevin Ajili, Eric Su, and Arindam Sarma worked with Atollogy on research that analyzes data from production lines. The team spent their first CSSPP quarter working to help an Atollogy customer understand the flow and activity of cement trucks in their yard. Using advanced image-recognition algorithms, the students researched and tested methods of license plate recognition, providing Atollogy insight into the most effective solutions to their problem. The team then worked with Atollogy on the “Greens Only” project, the goal of which was to find an efficient and effective way to identify foreign objects in a produce production line. The team focused on building an automated detection system specifically for spinach. Because spinach is always a uniform green color, foreign objects, which will almost always be some color other than green, are easier to identify. Ultimately, the solution depended on a combination of hardware and software solutions with computer vision algorithms. To replicate conditions in the real facility, the students had to create their own data in order to test the software. Although challenging, working on the project was rewarding because the students were able to experience working closely with a Silicon Valley company, and they were able to see the results of their hard work implemented in technology used by Atollogy. The project also provided the opportunity for networking, and three members of the research team will intern with Atollogy this summer. In addition to Atollogy and Topcon, the corporate sponsors of student projects this year included Amazon Lab 126, Kateeva, Mira Bella Energy, Nanometrics Incorporated, Nevro Corporation, Oracle Labs, and Seagate Technology PLC.